Forum Index > Off-topic Talk > How do you display your sword and scabbard combos? 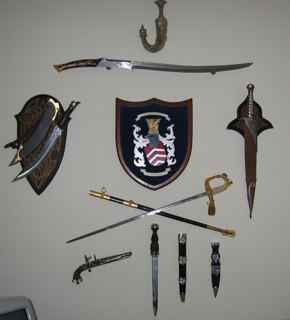 Posted: Wed 29 Sep, 2010 9:57 pm Post subject: How do you display your sword and scabbard combos? I've been lurking for a long time (years!) and finally have a question I haven't answered by persistant reading and researching. I have a beautiful custom sword coming from Arms & Armor, complete with scabbard and matching dirk, and am at a loss as to how to display it. Up until now, I've been limited to a wallhanger for decor and a basic plaque and a long dagger on a horizontal display stand on a shelf. This piece, however, deserves to be displayed front and centre. My condo is relatively small, and I don't have any surfaces to put it on, which limits me to wall displaying. Does anyone have any photos/advice on displaying all three pieces? I cannot reconcile it mentally without thinking it looks unbalanced. Well most of my swords with scabbards are ounted on walls so that scabbard hangs slightly at angle crossing over the sword - that way you see both the blade and the scabbard. Sadly I got no photos at hand at the moment. Now THAT is a MAN-CAVE! Great mancave indeed! I wish. I'll bet my place would go in there with room to spare for parking. That being said, does anyone have any pics of how you've got your blade/scabbard combos displayed? Pretty please? My solution is rather simple. Scabbards in the closet, blades on the walls! 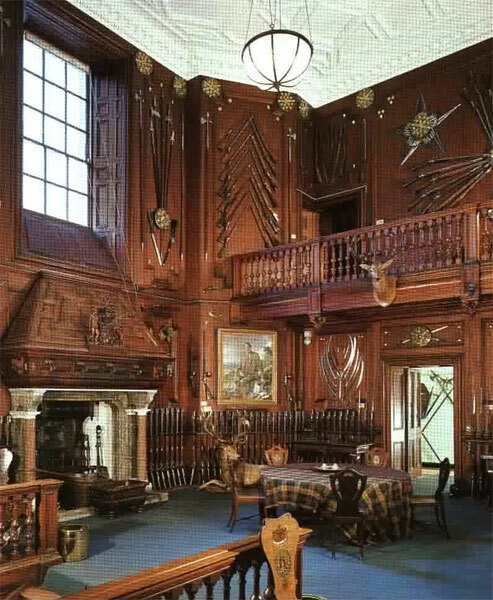 BTW if you really want a heart stopper closer to home, tour the Governor's Palace at Williamsburg. Wow! I don't display any of my swords. Everything I own weapons-wise is locked in my firearms vault for safe keeping - I only take them out when doing events or for the occassional cleaning. I don't want to run the chance of a burglary or home invasion arming half the criminals in my area with my swords, firearms, and other assorted goodies from my collection.